I blogged over the summer about my dress inspiration, talking about wanting to make a TNG Troi Skant inspired dress with Colette’s Macaron pattern. Since starting the design process, I’ve gone back and forth on this dress. Do I want it to be the skant uniform? Or just an dress inspired by the skant that I can wear on a normal day. But first, what’s a skant? 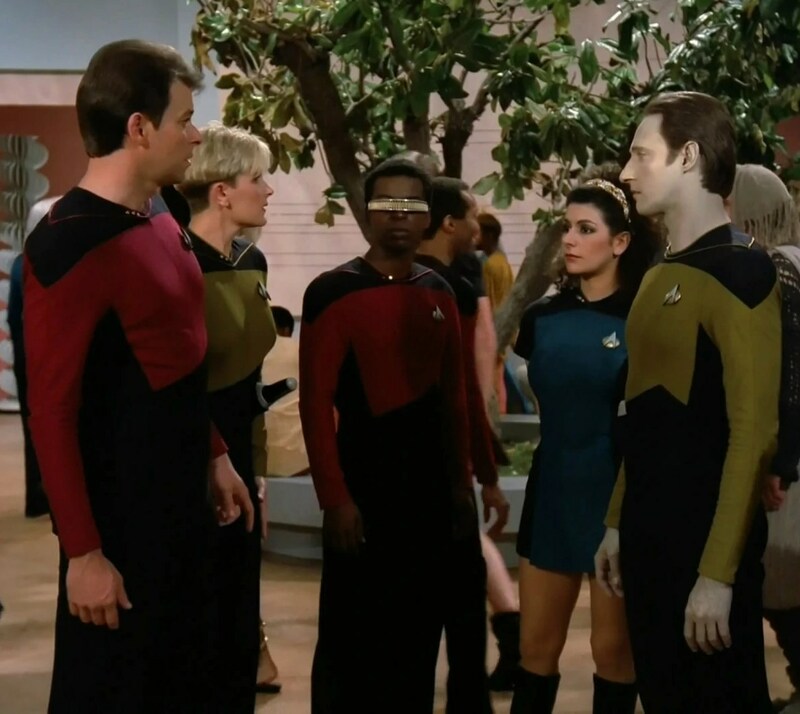 It was supposed to be a gender neutral uniform; another way that Roddenberry wanted to show that people in the future were more open minded. I’m back to thinking I want to make a real skant- maybe a tad longer than the mini skirt skants on the t.v. show, but something that is meant to be recognized as one of the real deals. So, basically a 60s styling, aka a shift dress. I can’t believe how many 60s dress patterns I own. But I can. Before we left Vermont, a woman who knew I was teaching sewing from my home, and had a lifetime’s worth of sewing patterns, gave me a bunch of them before she set off to relocate in Florida. Very generous, indeed. I went through them, looking for a center long seam and a high neck and that shift dress basic. I found this vintage Simplicity 7482. Along with the Built by Wendy book I have, I think I was ready to start plotting more specifically how I would colorblock it into a skant. Besides having a sleeve issue which I think rest and a fresh start tomorrow will fix, everything is going rather well. It’s not a difficult dress to construct. It’s just trying to make sure my dress will look like the costume I’m emulating. To save myself time, I used one of my dress blocks so I wouldn’t have to spend a lot of time in the fitting stage. I’m using a knit fabric so I knew I’d definitely be okay starting with the size 12 the vintage pattern came in for the back. The front was getting altered using my block. I had to cut the altered pattern apart for the colorblocking and add seam allowances where I had made the cuts. I’m done for the day but I can see how I should be finishing this one up pretty soon now. I do have more costume plans to kick off the new year. A new corset is on the midwinter list. Raise your hand if you’re into costuming. What draws you a period in time? What gets you to finish a period garment or costume? A con? A costume party? Where do you go all dressed up in your costume? I draped a TOS skant pattern last spring. Those 60’s Trek designs are amazingly complex for how simple they appear! I have an interesting project planned for my pattern, but I do want to make an authentic as I can version for myself too. I’ve been trying to decide if I want a red engineering or sky blue science officer version (I have the real deal double-knit fabric in both colors). I usually get outfits or costumes made for myself if I have a place to wear them – and it’s usually last minute. I can’t wait to see your TNG version! I can’t remember – are you going with Troi blue? oh, cool. 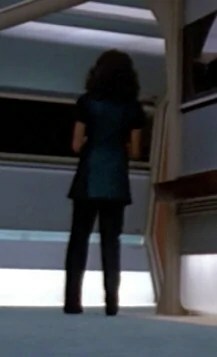 A TOS skant seems way more intricate than the seldom seen TNG ones. For sure. How did you get the real double knit fabric? I’m going with Troi blue- sciences color. I need to get the combadge. 🙂 I’m excited cos the con I want to wear this at isn’t till Spring. So I’ll have it ready to go. I got my double knit online after a reeeaallly long & determined search (I’d have to dig out the link – let me know if you need it). It’s a truly gross polyester fabric but it is exactly what they used back then and nothing ever looks as good when you are copying TOS. I found red on more than one site but the blues are really hard to find in the Trek shades, which is why even a lot of the official uniforms are the wrong color. I bet they were custom dyed for the shows. I’m currently ok with the fabric and changes I’m making. I got a Sophia ponte knit. It’s as close as I’ve seen in person. Knowing that even the official ones for fans aren’t the right color makes me feel better. I did a TOS skant in red last year for a Star Trek theme party that we threw and it totally got me excited to do more costuming. I’m still a newbie seamstress so it was a bit challenging for me to figure it all out. But in the end it turned out great. I think I’m the kind of person who really needs a clear project and a deadline to work with, so making costumes for parties or conventions is perfect for me. It’s addicting, isn’t it? I also love deadlines. I need them. OMG! i WANT ONE! But sadly I’m no seamstress 😦 Still, Great fun checking out your inspiration here. Kristina at http://nerdysewist.wordpress.com sent me and I’m glad she did! Well, hey, I’m sure Etsy’s got someone making them to sell…or maybe Kristina and I can get you to start sewing. It’s possible. thanks for coming over. 🙂 Well one of you would have to teach me to use a sewing machine first, lol. Sadly I can’t see it happening any time soon. Its funny, my boyfriend always jokes and tells people I already have a Star Trek uniform.But I don’t, I’m a bit of a closet Trekkie. I always imagined the ‘guy’s’ uniform I never realised that this is the kind I’d want! Can’t wait to see how yours turns out, I’m sure it will be amazing!